Call Japanther whatever you want. Just don’t call it a band. The Brooklyn duo, consisting of members Matt Reilly and Ian Vanek, formed in 2001 after meeting while attending Pratt Institute. “When Matt and I formed our band, we formed it at an art school, and we said its much more open-ended if we say that we’re doing an art project rather than using the word band, because that’s kind of a meaningless word at this time,” Vanek shared. He likened the idea of being in or referring to what he does as a band as something people often do or say in the interest of “making it.” But the word “band” is too stagnant for Vanek, pointing toward connotations with popular. After postponing a tour scheduled for earlier this year, the duo eventually made its way to Berlin, first in July, and again this month. 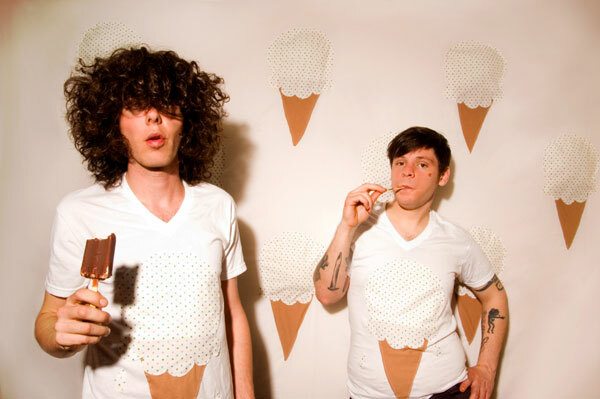 The tours were in support of Japanther’s newest album, “Beets, Limes and Rice,” which was recorded in the summer of 2011 in Los Angeles, and released on October 31 – slightly more than a year ago. He cited the album as his and Reilly’s favourite thus far, although he has high hopes for the next album, which isn’t that far off. Vanek also admitted without shame that he loves listening to Japanther albums, be it while he is out running or just home hanging out, not only because of the memories they evoke but also because he’s stoked on his own art. Although it’s easy to become discouraged when a passion doesn’t pay, Vanek said he is often motivated by other artistic individuals who don’t allow money to keep them from pursuing their own dreams. For many, always setting goals and constantly working toward them can be hard to manage, but for Vanek, he said moving from one project to the next is something that happens relatively easily, without his projects vying for attention. For the sake of perspective, sometimes Vanek will compare himself to past versions of himself, just to see how far he’s come. In comparison to the version of himself 10 years ago, Vanek feels he’s come a long way. However, he also shared that in 10 years, he can foresee himself looking back at the person he is today and feeling like he’s come even further. But it’s this kind of learning from himself that pushes Vanek on and motivates him to continue with art that inspires and excites him. This entry was posted in Interview and tagged American, Feature, Interview, Japanther. Bookmark the permalink.